1991: The fight for decriminalisation was actually initiated by AIDS Bhedbhav Virodhi Andolan way back in 1991. Their historic publication— Less than Gay: A Citizen’s Report spelled out the problems with 377 and asked for its repeal. A 1996 article in Economic and Political Weekly by Vimal Balasubrahmanyan titled ‘Gay Rights in India’ chronicles this early history. 2001: The struggle was perked up with the NGO, Naz Foundation filing a Public Interest Litigation (PIL) before the Delhi High Court, challenging the constitutional validity of Section 377, which criminalises sexual activities which are “against the order of nature”, and includes within its purview even consensual sexual acts between adults in private. The NGO had essentially contended that the provision, to the extent that it penalises sexual acts in private between consenting adults, violates the India Constitution, specifically, Articles 14 (equality before the law), 15 (non-discrimination), 19(1)(a)-(d) (freedom of speech, assembly, association and movement) and 21 (right to life and personal liberty). 2004: The Delhi High Court dismisses the PIL, opining that purely academic issues had been raised therein. The same year, it dismissed a review petition against its order as well. April, 2006: Supreme Court allows the challenge to both these orders by Naz Foundation and remits the matter back to the High Court for fresh consideration on merits. The verdict saw a carnival from the supporters of the community when the members of the community came out in the open without any fear of societal stigma. The judgment was viewed as their acceptance by the society, and not merely as the legalisation of certain sexual acts. The Centre did not challenge this decision. However, fifteen Special Leave Petitions were filed before the Apex Court by several religious groups from all over the country. Seven Intervention Applications were also filed, out of which five were in support of the High Court decision while two were against it. December 2013: The joy was short-lived as a two-judge Bench of the Supreme Court in Suresh Kumar Koushal and Anr. v. Naz Foundation and Ors.upheld the constitutional validity of Section 377. It opined that the alleged discrimination and violation of fundamental rights cannot be culled out from the past cases. It further noted that no uniform test could be asserted from these cases to classify acts that would fall under Section 377. Rather, the court stated that acts can only be determined with reference to the act itself and the circumstances in which it is executed. June 2016: A two-Judge Supreme Court bench refers a petition against the provision to the Chief Justice of India to decide whether a Constitution Bench should hear it. The petition had been filed by several well-known persons, including dancer N.S. Johar, journalist Sunil Mehra, chef Ritu Dalmia, hotelier Aman Nath and business executive Ayesha Kapur. January, 2018: Supreme Court refers petitions filed by a few LGBT citizens for consideration by a larger bench. 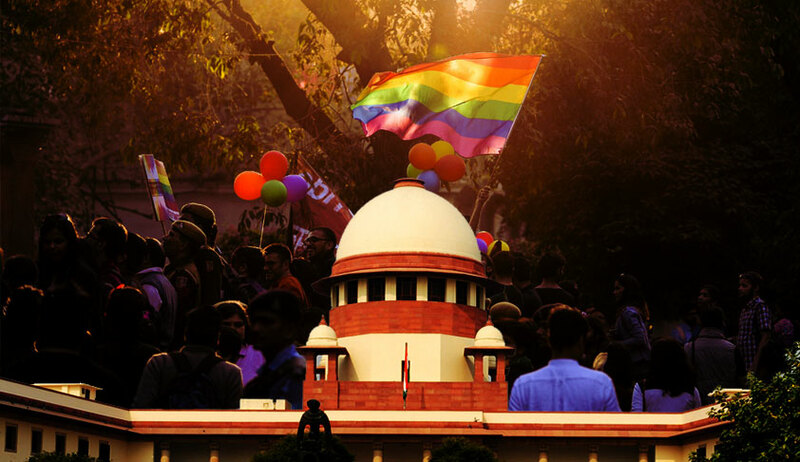 While referring the matter to the Constitution Bench, the bench headed by the CJI noted that Section 377 IPC, in so far as it destroys individual choice and sexual orientation, cannot be regarded as a reasonable restriction on the exercise of one’s fundamental rights. It also observed that the individual autonomy and individual orientation cannot be atrophied unless the restriction is regarded as reasonable to yield to the morality of the Constitution. 10 July, 2018: A bench comprising Chief Justice Dipak Misra, Justice A.M Khanwilkar, Justice D Y Chandrachud, Justice R F Nariman and Justice Indu Malhotra begins hearing the challenge. The Court has a total of six petitions before it: 1. Navtej Singh Johar v. UOI, WP (Crl) No. 76/2016; 2. Akkai Padmadhali v. UOI, WP(C) No.572/2016; 3. Keshav Suri v. UOI, WP (Crl) No.88 of 2018; 4. Arif Jafar v. UOI, WP(Crl) No.100/2/18; 5. Ashok Row Kavi & others v. UOI, WP(Crl) No.101/2018; and 6. Anwesh Pokkuluri v. UOI, WP (Crl) No. 121/2018.